Prototyping new digital news solutions has been a core piece of the Colorado Media Project this summer. Cultivo Media, a Denver University student-led digital marketing and product development team, was brought on to the Project to tackle prototype research and development — in an effort to create and market test additional digital solutions for Colorado’s news consumers. The prototyping process is all about the end user. Cultivo conducted empathy interviews with Coloradans from across the state to hear first-hand about their personal experiences and challenges with Colorado local news today. The Colorado Media Project did not evaluate the feedback, but rather used the insights from these in-depth interviews to explore potential solutions. Our main question was: Which pain points are the most common? From these common themes, and with community feedback gathered at Colorado Media Project design thinking workshops, Cultivo narrowed in on four problems for which to prototype and test solutions. After four weeks of testing, Cultivo determined which elements of each four prototypes were successful and why. These prototypes are discussed below — along with links to a detailed report on each one. locations that they frequent. The user can open the feed view of stories, compiled from their frequented locations, to read them. When a user enters a new part of their city, or a specific building, they will occasionally receive a push notification with additional stories or updates from that location. GeoStory is a daily email digest of stories that have been personalized based on where the user spends most of their time. This can include both their home and work locations. Do you work in Denver but live in Boulder? Great! The stories sent to you will be relevant and able to reflect both locations. The test user group found the stories and information shared to be both relevant and valuable due to the tagged location. By clearly demonstrating where news had impact in relation to a user, the information felt more applicable. Users mentioned that tagging story locations would work well in many formats, not only as email. Tinder - for news! When opened the user sees a card with an image/video, a headline, and a brief description. Swiping right saves the story for later, swiping left lets the user skip to the next story, swiping up opens instant share, and clicking opens the content to read or view. The system will learn what the user likes as they swipe and provide just enough stories at a time to keep them coming back for more. Storyhound will allow users to swipe on stories to be able to read them immediately, save them for later, or pass, based on the user’s own interest-level. The idea is that users can have quick and easy access to the bite-sized Colorado news constant that can be both entertaining and rewarding. 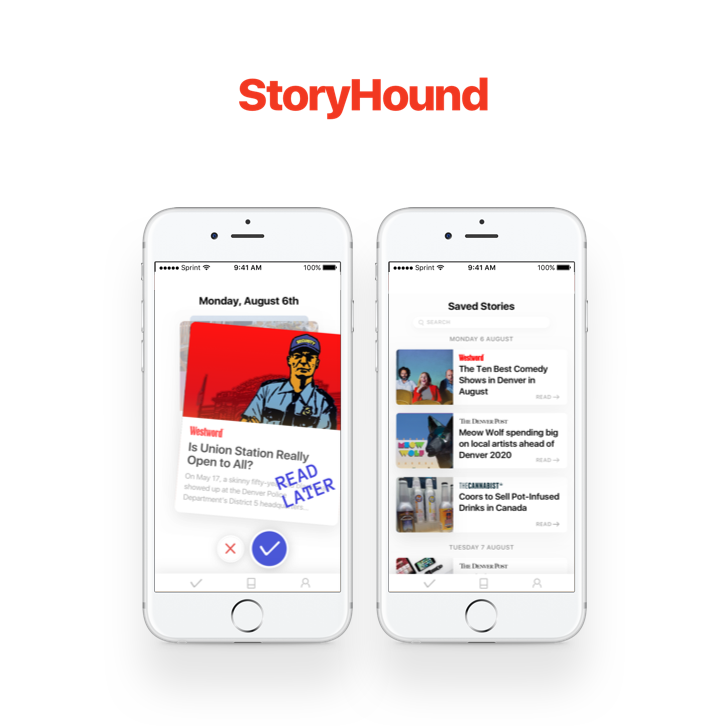 Overall users were eager to have StoryHound available for Colorado news and had numerous suggestions for additional features and design improvements. Test users felt that having endless content was key, and commented that StoryHound could be a replacement for time killing scrolling on social media platforms. Personalization of the news stories was a top feature request. Coloradans want to break out of their political bubbles, but express that they don’t know how to do this or are afraid to. When using Inspectre, a political scale featuring more articles on the same topic written from different perspectives appears at the bottom of an article on the news site a user is already using. The user can click the stories on the scale to be taken to read/watch them or to save for later reading. While reading an article on WSJ.com, a user can easily see the scale appear and hop over to nytimes.com to see an article regarding the same topic. InSpectre News is designed to offer a balanced and two-sided look at the hot-button issues affecting Colorado. Every article posted on the InSpectre site features follow up reading on the same issue from different perspectives and opinions. The results for InSpectre showed us that while people may say they want to hear both sides of an issue, they don't typically take action on this. When empathy interviews were conducted and the theme of people wanting a political counterweight emerged, we acknowledged the possibility of people just feeling like they should have this, rather than actually wanting it. Interview feedback, as well as user analytics on 235 unique sessions on the website, we found that individuals do not take action on follow up reading, and if they do, it is usually within their existing opinions. interesting and relevant pieces of bite size content. By featuring podcast excerpts, short videos, and major headlines linking to full articles The Daily Snack is a great way for users to feel prepared to talk about the news with their peers. The Daily Snack is a feed that updates once in the morning and once in the evening with 10 pieces of addictive, bite size content sent out with a push notification. A user’s Daily Snack feed is curated based on their interests and preferences to catch them up, keep them informed, and expand their knowledge. The prototype is two Twitter feeds that update twice daily with five pieces of new "snackable" content (1-minute videos and podcasts, Colorado tweets, or brief article summaries). Test users enjoyed the bite-sized pieces of news content and many expressed surprise that the content was all local. A common piece of feedback was that 4-8 pieces of content each morning felt like the perfect amount. Coloradans retweeted the content frequently during the testing period and the account acquired an organic following.